More specific links regarding CESNUR, so-called "cult apologists" and Catholic fundamentalism, in Italy and around the world, can be found on this other page. The most complete source on all the wars the Empire is running now, updated every day. "I want to reach Palestinian people in the hope of providing some comfort: I am a Jew and former Israeli who sees their suffering and acknowledges its origins. I want to reach Israelis in the hope that my views and feelings will perhaps help to free them from their trauma, enough to see the situation more clearly, and not only through the distorting lens of their fear." Blog di Mary Rizzo sulla Palestina, in lingua inglese. Nearly fifteen thousand pages of very well organized and documented material on religious news and also on "cults", put together by Anton Hein in Amsterdam and updated on an almost daily basis. A good collection of links on cult related issues on the Net. Good resource on the operations of the multinational corporation called "Scientology." Amusing debunking of a particularly pretentious group. The site was closed down by its first server after threats from the group, and has now been reopened by a more courageous server..
"Devious Displays of Quackery, Fraud, Deceit and Deception -- the largest collection of medical chicanery and mayhem ever assembled under one roof." Everything about Mel Sembler, currently US ambassador to Italy, and his cult-lke "therapy" organization The Straights. Links to critical documents on cult apologists of various sizes and shapes... in French, but links are always easy to understand! The strange story of Massimo "Abdul Hadi" Palazzi and his "Association of Italian Muslims", with New Age gurus, Somali colonels and the Italian secret services. Reverend Stephen Sizer's richly documented critical site on Dispensationalism and American apocalyptic extremism. Exposing TV Evangelism and cultural colonialism. Opposing the fundamentalists on their home ground, with interesting links. 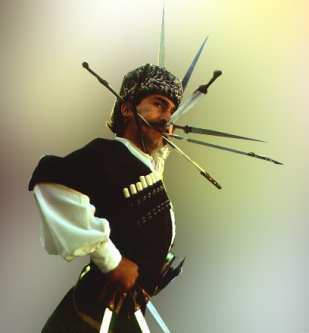 The unique world of Abkhaz, Chechens, Circassians, Ossetians and other peoples of the Northern Caucasus. Nature and peoples of the Danubian world. The gateway to Cyprus, Iraq, Syria, Palestine, Lebanon and Jordan. A portal to Palestine and its culture. A vast collection of links and information from the Altaj mountains to the Balkans. Visions of the Islamic world. It is hard to conceive of better images to represent an imageless religion. English, Scottish and French Popular Ballads. Although not mentioned on this website, Riccardo Venturi also speaks nineteen languages, has written a gigantic Icelandic grammar and is an obstreperous leader of the Firenze football fans. "A site where the curious, the scholar, the historian, the genealogist, the heraldist, the noble and ignoble may browse and/or contribute interesting, reverent and irreverent papers on genuine and whimsical kings, emperors, episcopi vagantes, nobles, titles, orders and other such subjects which are unlikely to have any influence on the world in which we live or on that which we are preparing for our children"
One of the most ancient surviving forms of Christianity, with its unique language descended directly from Ancient Egyptian. Everything from private armies for hire, with nice names like "Rubicon International", to the Lenin Mausoleum Home Page and the Bougainville Freedom Movement. I am not quite sure these qualify as visions, but they do make for fascinating reading, and are commented in a commendably objective manner. The richly documented website of Father Anthony Chadwick on the Roman Catholic liturgy, Church music and the pipe organ, with a very interesting page on the history and of so-called "Catholic traditionalism", and an extensive series of links to a world of honest mystics, good souls, ruthless fanatics and raving lunatics. Father Chadwick is certainly a rare individual: a clear-thinking liturgical traditionalist who does not believe in the Illuminati Conspiracy.